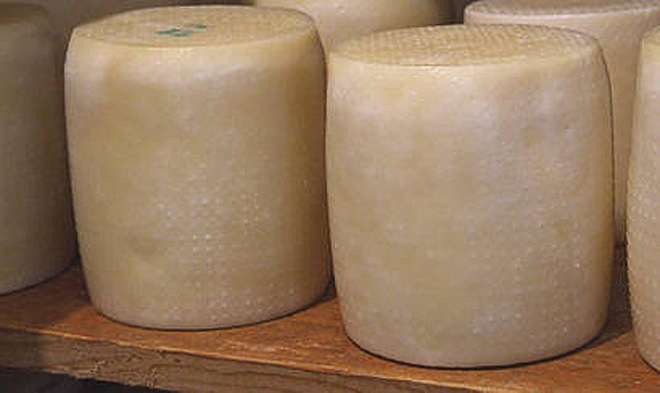 Lathotyri is a light yellow cheese with a strong flavor. It is lightly salted. The distinguishing characteristic of lathotyri is that it is aged and stored in olive oil, thus the name: latho from the word for “oil” and tyri meaning “cheese.” It is made with sheep milk or a combination of sheep and goat milk. Lathotyri is sold in small head-shaped balls, or sliced to order. It can be found at Greek or ethnic grocers, and sometimes at organic grocery stores. Most often used as a table cheese, lathotyri is also used as an ingredient in stuffing for rabbit, and grated, it can be used in filled pies with other ingredients. It can also be used as a cheese addition to bechamel sauce to cover baked vegetable casseroles.